The small parish of Choseley is situated in the north west corner of Norfolk, directly above the much larger parish of Docking. Its name comes from the Old English for ‘Gravelly grove’. The archaeological record for the parish is very small, though this could be due to a lack of detailed investigation, and the record may well fill out in the future. The earliest evidence of human activity in Choseley comes in the form of a Neolithic flaked flint axehead (NHER 1383), but this is the only prehistoric artefact recovered so far. There are no finds from the Bronze Age or the Iron Age. The silence of the archaeological record is then broken in rather spectacular style by the discovery of two large Roman coin hoards (NHER 1323), the first, of over 300 coins, in 1942, and the second, of about 600, in 1945. Dating analysis indicates that the coins were buried in the late 3rd century A.D., probably during a period of economic unrest. The exact location of the place the hoards were found is not precisely known, but they may have been within or near to a possibly Roman enclosure (NHER 1324). The only other Roman finds in the parish are a tile fragment (NHER 1385) and the reported discovery of a puddingstone quern in 1950 (NHER 1386). After the departure of the Romans, the record again goes quiet, with the single exception of a Late Saxon ring (NHER 28275). The medieval period following the Norman Conquest usually provides a parish with its oldest surviving building, the church. However, in Choseley, the church, and indeed the entire medieval village it served (NHER 11956) have long since vanished, being deserted in the 16th century, probably as a result of arable land being converted to sheep pasture. There was also a leper hospital in the parish (NHER 1591), in operation before 1200. Nothing of the hospital now remains, but medieval pottery fragments have been found on its reputed site and there is much reused limestone in the existing farmhouse and barn, Choseley Farm (NHER 21554). This is a large post medieval mansion dating from the mid to late 16th century, with a barn and outbuildings converted to residential use in the 1980s. Because the exact location of the medieval village, church and leper colony are not known, the presence of reused limestone in the farmhouse and barn may indicate that the leper colony was close to them. However, human burials found on the site showed no sign of having suffered from leprosy, and so it is equally possible that the church was here, and the burials were part of its cemetery. The parish’s location near the coast made it a good location for military defences, and a 1946 aerial photograph shows a military site at NHER 21550, including buildings and a pillbox. Today, only the pillbox remains, tilted over on the edge of a sandpit. 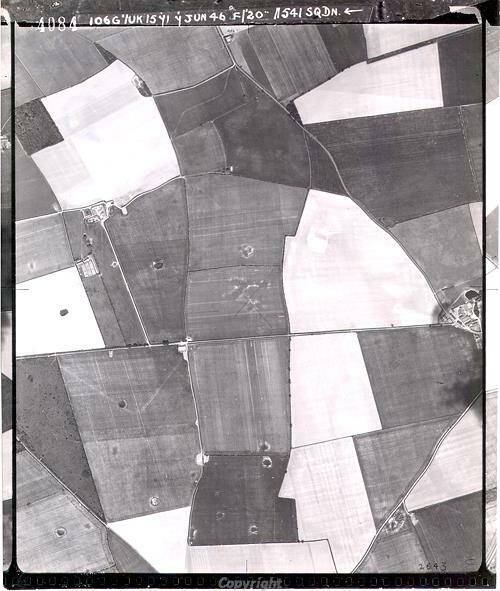 The parish was also well placed for the defence of the neighbouring airfield at Docking during the war: a light anti aircraft gun emplacement (NHER 26671) can be seen on 1946 aerial photographs, although nothing remains today. Piet Aldridge (NLA), 30 November 2005.